in 1989 and later demolished in the early ‘90s. Despite almost a century of industrial use, the site has only minor environmental concerns affecting reuses. From an industrial plant built on farm land, the site remerges as Springbrook Farm. The Springbrook Farm vision is that of a major new development to be anchored by a new farm-to-table local producer concept and abundant green space, connected to a centralized mixed use city center. The site is adjacent to two major north/south corridors, Alcoa Highway (State Route 115/US 129) and North Hall Road (State Route 35), and (as part of TDOT’s plans for the new Alcoa Parkway/Alcoa Highway Re-located) is to have direct future access to nearby McGhee Tyson Airport. The site is edged by both the Springbrook and East Hall neighborhoods, which are neighborhoods of significance to the city’s company town roots, as well as quality commercial/office within Springbrook Corporate Center. A portion of the site has already been developed for the new Alcoa High School. This state of the art school, which has an architectural theme borrowing from the City’s past school buildings, opened in the fall of 2015 and is prominently positioned for future roadway improvements. All K-12 City schools are in close proximity to this site, within a campus-like setting. Open space, parks and recreational trails are also features nearby, with additional trails planned to and around the schools. These existing trails are connected to the widely renowned joint Alcoa-Maryville network, which follows Pistol Creek. Pistol Creek, a tributary of the Little River, is also an adjacent feature of this site. Over approximately 265 acres make up the general site area for development and open space opportunities. In September of 2014, the site was the focus for an in-depth workshop held by national experts with Smart Growth America (SGA). 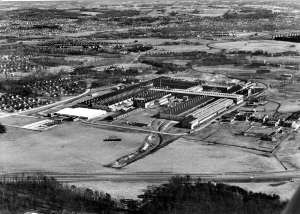 One of the outcomes was the benefits of detailed master planning and the need for an updated plan of the former Alcoa West Plant site. Following SGA’s visit, a City goal was to commission the development of a master/vision plan for this site. Although conceptual plans had been prepared in the past, those plans never materialized. Two planned roadways, one of which is under construction, have now given rise for development of a guiding plan. The City of Alcoa has also taken on a larger role in the development, partnering with the developer, and is responsible for construction of these two roadways and the associated utility infrastructure. Construction started on Tesla Boulevard this past April, and it is anticipated to be completed by this upcoming spring of 2018. The roadway was previously referred to as the Local Interstate Connector (LIC) and follows the property’s major highway frontages. The other, an extension of Associates Boulevard, is currently under design and is planned for construction late this upcoming spring or early summer of 2018. This extension will proceed northeast to serve as a main road frontage for the new Alcoa High School and incorporate additional improvements as it intersects with Springbrook Road. The City of Alcoa’s vision for this master/vision plan was to create a primary city center or downtown concept on this site to be reliant on a functional transportation network and the coordination of outlying land uses. The objective to developing the plan was to make correlations between the site’s broader transportation network and land uses, and this downtown concept to achieve positive synergies. Further, transit opportunities were also to be accessed for future local and regional type services. Details were to primarily focus on identifying a portion(s) of the site for mixed use redevelopment opportunities (i.e., commercial retail, office, residential and open space), facilitating the growth of this primary city center or downtown concept. To support and enhance this concept, other considerations included designating areas for sole commercial, residential and open space uses. Particular attention was also to be placed on residential and open space opportunities along Mills Street, thereby maintaining a residential component at the edge of the Springbrook neighborhood, and to provide a transitional land use buffer for commercial activity to occur beyond. The development and support of the master/vision plan for this site consisted of a consortium of partnering organizations that included the City of Alcoa, the Knoxville Regional Transportation Planning Organization (TPO), Resight, Inc., Arconic (formerly Alcoa, Inc.) and the United States Department of Transportation/Federal Transit Administration (USDOT/FTA). The USDOT and FTA provided funding for this plan, as part of a grant match cost share with the City of Alcoa. The master/vision plan development was overseen by the City of Alcoa Planning Division of the Planning and Codes Department. A main point stressed before the consultant team was that the plan be flexible and should serve as a vision to guide redevelopment of the site. In addition to development of the master/vision plan by the lead consultant team of Kiser + Vogrin Design and Volkert, Inc. of Franklin, TN, an advisory group was formed to assist in providing technical level expertise. This local group represented the city’s planning, engineering, electric and administrative management staff, the developer and the developer’s real estate brokering representatives, as well as transportation planning staff of the TPO. As past community planning exercises had taken place over the years, this planning effort recognized that the site was at stage of development where technical level expertise would be paramount. A public open house was held on September 28, 2017 at the Alcoa Service Center to view and discuss the master/vision plan at a preliminary level. The turnout was large, with an estimated 230 plus individuals in attendance. The plan was received well by the public, which was overwhelming validated verbally and by receipt of written comments. The master/vision plan reflects an urban design, reliant on a functional transportation network, which incorporates a broad spectrum of land uses that are in close physical proximity and complement each other. In addition to a large open space park area to be surrounded by mixed use development, which will also connect to Springbrook Park via sidewalks and greenway trails, particular attention was placed on residential and open space opportunities along Mills Street to provide a transitional land use buffer for commercial activity to occur beyond. One particular goal of the master plan visioning process was to highlight pedestrian access of the site or overall community walkability, including providing for opportunities to incorporate future transit service destinations. Given the site’s connectivity to the airport, and access to the existing and planned major north/south corridors referenced earlier, it is anticipated that the site could function in the future as a significant transportation hub. The master/vision plan street, sidewalk and greenway connections will also allow enhanced multimodal access to the adjacent neighborhoods. A notable feature of the master/vision plan is that it includes an urban farm concept. From an industrial plant built on farm land, as previously pointed out, this reintroduction of farming to the site supports the growing farm-to-table movement and provides an opportunity to even incorporate a farmers’ market nearby. This farming component is intended to increase overall sustainability of the site and acts in concert with the premiere integration of its greenway and abundant open space connectivity mentioned earlier by way of a Springbrook Park expansion, which has contributed to the developments emergent namesake as Springbrook Farm. As this site develops, high quality design will be important. Designers shall incorporate notable architecture accents and broader features in their overall building design, providing for compatibility with surrounding structures and thematic expression. Visual cues may include the combined use of brick, cornicing and arch work found in many of the City of Alcoa’s past and present institutional buildings, which nod subtly to the historical role of Alcoa, Inc. (now Arconic). Stacked stone, trellises, tapered columns and other rustic accents found in public spaces of Pellissippi Place are other visual cues to consider. The site, surrounding area, and City in general does have a unique history that should be told. The public realm provides opportunities for telling this story. It should be noted that the City also has certain historical elements from past buildings that should be incorporated into parks and plazas. Beyond this project, the development of detailed design guidelines should be a next step to ensure the overall vision is implemented.